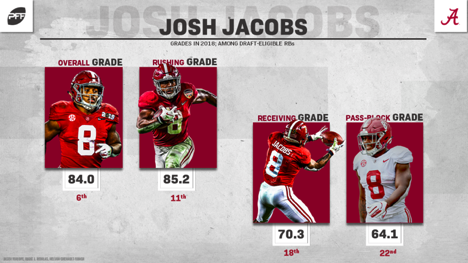 The top running back on the PFF Big Board, Josh Jacobs showed his versatility, power and instincts out of the backfield this season. Although his 84.0 overall grade ranks a mere sixth overall in the draft class, his violent running style and patience with the ball make him the type of running back NFL teams covet on draft day. 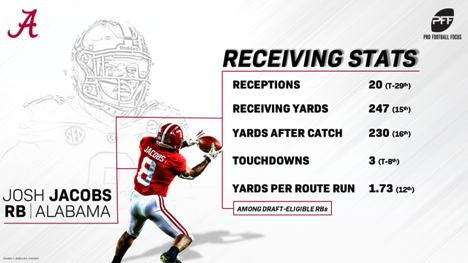 There was little to no doubt that Jacobs made the most of his touches this season. He converted 41.0% of them into a first down or a touchdown. He utilized his low center of gravity to push for extra yards and averaged 4.1 yards after contact per attempt as well. Even though Jacobs had split duty during his time with Crimson Tide, he made every snap count. Although a small sample size, Jacobs only gave up two quarterback pressures in 35 pass-blocking snaps and was able to pick up blitzes with quick recognition to protect the quarterback. 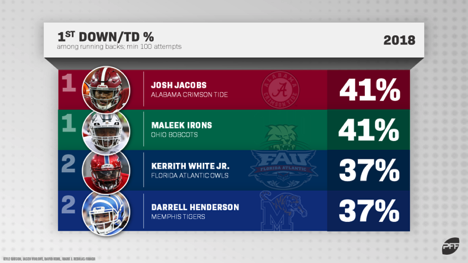 Jacobs is a legitimate receiving threat, as well. He didn’t have many receptions, but he made them all look good. He averaged a ridiculous 11.5 yards after the catch per reception and had a 151.0 passer rating when targeted. When given the ability to get a favorable matchup in coverage, Jacobs can make opposing defenses pay.